Dolls were brought into the world long ago to serve as representatives of the gods, and have traditionally been regarded as sacred objects. The art of Karakuri is tied to this tradition. These dolls developed as festival attractions, toys, and performance implements, leading to the Karakuri dolls we know today. 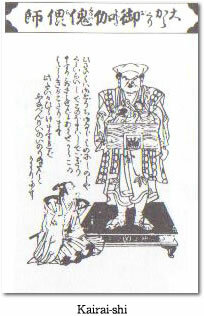 According to the literary record, Karakuri dolls date from 658 CE, when Chiyu the wandering monk is said to have created a Shinansha, or south-pointing chariot. This information, recorded in the Nihon Shoki, is thought to indicate the origin of Karakuri dolls. According to the Nihon Shoki, Naka-no-Oe no Oji (who later became Emperor Tenji) created the first water clock (toki no kisami) in May of 660 CE. He used this clock to keep citizens informed of the time. Further on in the Nihon Shoki, it is recorded that on April 25th of the tenth year of Tenji's reign, the water clock was placed on a new stand and a gong was sounded to announce the hour for the first time. This date corresponds to June 10th, 1671 in the Gregorian calendar. In 1920 (Taisho 9), this day was designated as “Time Day”. Every year on this day, the Water Clock Festival is held at Ōmijingu, the shrine where Emperor Tenji is enshrined. Moving on to the Muromachi period, one finds references to the word ayatsuri (puppet) in the journals and diaries of members of the imperial court and nobles, including the following passage. 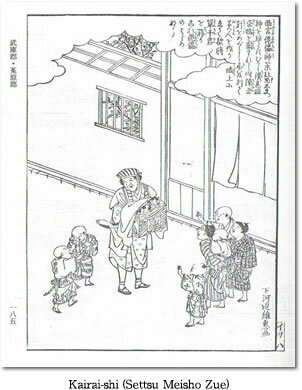 “On the grounds of the Bon Odori festival, there was a puppet who danced and rang a bell” (Kanmon Nikki, 1421). “Mechanical lanterns representing scenes from plays such as The Battle of Ichi-no-Tani and The Duel of Ushiwakamaru and Benkei were presented to those at the imperial palace” (Kanmon Nikki, 1436). “A mechanical tsurukame (crane and tortoise) ornament was given as an offering to the imperial court” (Kanmon Nikki, 1437). (From Senda Yasuko, Karakuri Ningyō no Hōko - Aichi no Matsuri wo Tazunete, pp. 30-31). “The word Karakuri first appeared in 1579 CE, when it was used to designate a square box with 1.8 meter sides in the shape of a castle, inside of which up to 2,000 soldier pawns representing the armies of both sides of a battle could be lined up. 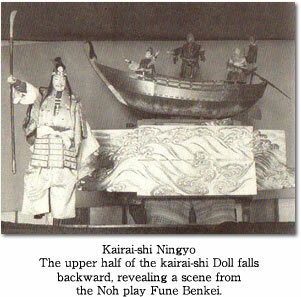 At this point in time, however, the dolls were still being called Ayatsuri Karakuri Mono, and use of the abbreviated term Karakuri had not yet been established. (Nishitsunoi, Masahiro, Owari no Dashi-Karakuri, pp. 8-9, published by the Nagoya Castle Exposition Planning Committee). Puppeteers known as Kairai-shi (傀儡師) or Ebisu-Mawashi (戎回し) appeared between the Heian and the Muromachi periods. Kairai puppeteers roam through towns with a wooden box slung around their neck. On top of the box are small dolls which the puppeteer controls by putting their hands inside the box and using their fingers or strings. This simple technique is used to make the dolls dance to musical accompaniment. Karakuri parade floats which utilize the Kairai technique still exist today. Among the five floats which serve as the centerpiece of the Kamezaki neighborhood parade (Handa-shi, Aichi prefecture), there is a doll considered to be a “living relic” of the Takeda Karakuri. The Kairai-shi Ningyō, which has been passed down through the generations by the Tanaka group of Kamezaki, occupies the top level of the Kagura-sha parade float. The doll is modeled after Kairai-shi street performers from the Muromachi and Edo periods who were inspired by the Karakuri dolls. The doll first gives a show featuring Chinese dolls, performed on top of a wooden box slung around its neck. 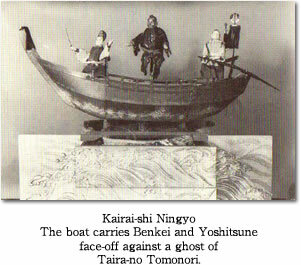 Next, the upper half of its body falls backward, revealing a scene from the Noh play Fune Benkei in which a boat carrying Benkei and Yoshitsune faces off against the boat of Taira no Tomomori. The doll is thought to date from the 1750s (Hōryaku period).